On a misty morning, the anchors of Essar Wildcat were down and the permanent chasing penant had been passed to the work vessel for an upcoming project. The Wildcat team was all set for yet another challenge in the high seas, 35 kms off the Kakinada coast, welcomed by the ever-present strong currents and wind speed of up to 5 knots. All the units of the Wildcat team were ready with their gears to make their first contact with the seabed (Spud) and start the project of drilling the well. Float boxes to lay on the seabed had been prepared, deck crew loaded up 30” casing and subsea crew worked hard in preparing for running the blow out preventer by servicing and testing it. The mud pits filled up as the Marine team ballast the rig and took all the bulk requirements, barite, cement, fuel and water. It had been declared that this well will be a challenging project, to say the least. But the crew mustered together, ever ready to take on the upcoming challenge to deliver another ONGC well on time and in budget. Each section commandeered successfully to the start of the next phase. A constant supply of stand by boats delivering tools and equipment, fuel, water and bulk, chemicals and supplies to help in smooth operations. As the team drew closer to the final stages of the well, some of their fears had come true. The team faced several kicks (a flow of waste gas from the well), but, all these were tackled well without incurring the loss of even a single day. 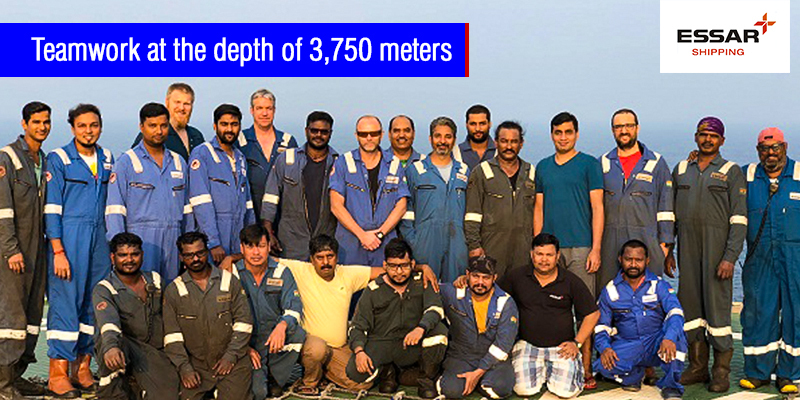 By the end, the team had drilled from a water depth of 173 meters to a total depth of 3,750 meters! This project was a great achievement for all the teams involved (from Mumbai, Kakinada to all the various crews that join together to make the operation run successfully). Congratulations to the crew for showcasing resilience and team spirit! In addition to its 15 land rigs, EOSIL also operates the offshore rig, Essar Wildcat, which is a semi-submersible rig capable of drilling in water depths of up to 1,600 feet and drilling depth of up to 25,000 feet. Since May 2017, this rig has been deployed on a three-year contract with ONGC on the east coast of India. In 2017, Essar Wildcat has achieved an exceptional safety milestone of 9 years without LTI. What is remarkable is that this was achieved despite the fact that the Wildcat operates in extreme weather conditions, and is manned by a multicultural mix of professionals!